This accolade is the latest victory for the 3008 SUV, which was voted the overall ‘Car of the Year’ in Auto Express’ Driver Power Survey last month. 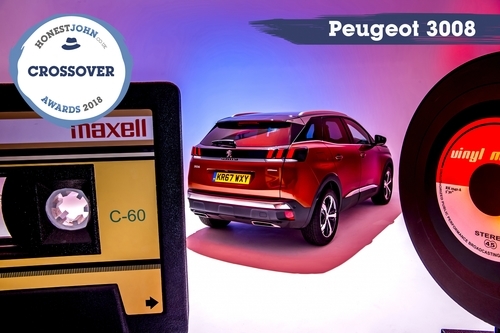 The Peugeot 3008 SUV has been named’ Crossover of the Year’ at the Honest John Awards 2018. The awards recognise the cars that have been the most popular with the readers of HonestJohn.co.uk, over the past 12 months. This accolade is the latest victory for the 3008 SUV, which was voted the overall ‘Car of the Year’ in Auto Express’ Driver Power Survey last month. Honest John praised the 3008 SUV for its impressive high tech interior, which offers a more intuitive and engaging driving experience through Peugeot’s unique i-Cockpit®. The i-Cockpit® comes with a compact multi-function steering wheel, 12.3” head-up digital instrument display and 8.0” capacitive touchscreen with Mirror Screen® functionality comprising, Android Auto, Apple CarPlay™ and Mirror Link®. A success since it launched in 2016, the 3008 SUV has sold 350,000 vehicles worldwide and 28,000 in the UK.